(UK Telegraph) A woman has been killed in an apparent bear attack while picking wild bamboo shoots in the mountains of northern Japan. The body of Masako Oishi, 61, a nursing assistant, was reportedly found with gashes to the back of her head in a mountainous forest in Akita prefecture, which is known to be populated by bears. The incident comes just weeks after local police issued warnings to residents living in remote mountainous areas of northern Japan to look out for bears. 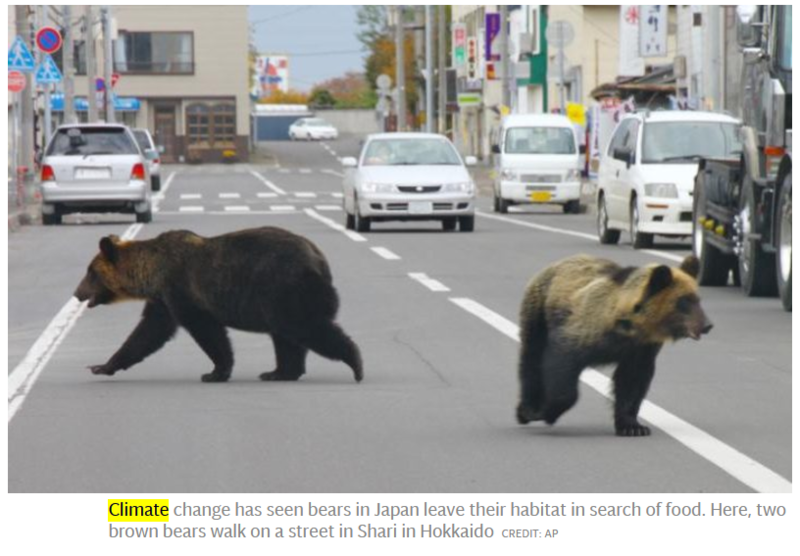 Climate change has also been attributed to the surge in bear attacks in Japan in the past, as a growing number of the creatures reportedly leave their natural habitat in search of food. This entry was written by William Teach and posted on at 4:13 pm and filed under AGW Idiocy, Global Warming. Bookmark the permalink. Follow any comments here with the RSS feed for this post. Irony? “Oishi” (the woman’s last name), if I am not mistaken, translates as “delicious “. Aside from the reporter’s clumsy syntax (bear attacks cause climate change! ), climate change IS changing the habitat and distribution of flora and fauna. If heat waves reduce the fecundity of the bears natural forage area they will widen their search rather than starve. In Hokkaido, during the first 57 years of the 20th century, 141 people died from bear attacks, and another 300 were injured. The Sankebetsu brown bear incident (三毛別羆事件? Sankebetsu Higuma jiken), which occurred in December 1915 at Sankei in the Sankebetsu district was the worst bear attack in Japanese history, and resulted in the deaths of seven people and the injuring of three others. The perpetrator was a 380 kg and 2.7 m tall brown bear, which twice attacked the village of Tomamae, returning to the area the night after its first attack during the prefuneral vigil for the earlier victims. The incident is frequently referred to in modern Japanese bear incidents, and is believed to be responsible for the Japanese perception of bears as man-eaters. From 1962 to 2008 there were 86 attacks and 33 deaths from bears in Hokkaido. The Ainu people worship the Ussuri brown bear, eating its flesh and drinking its blood as part of a religious festival known as Iomante.